(Bloomberg) -- Sometimes wait-and-see turns into cut-and-cut-again. 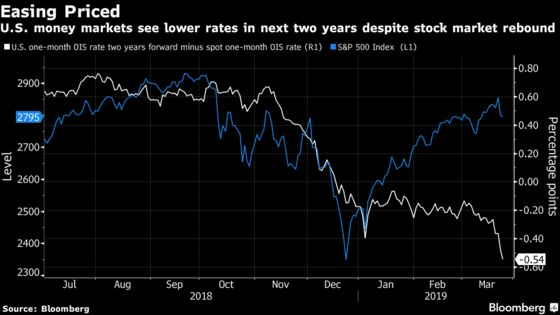 Since the Federal Reserve’s meeting last week, when officials downgraded their forecasts for the economy and future expected interest-rate increases, investors have become increasingly convinced that the next move is more likely to be down than up. 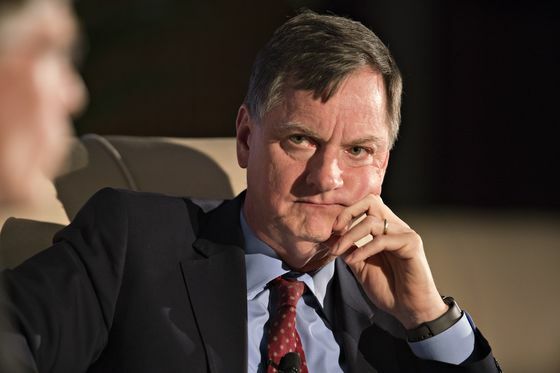 For Chicago Fed President Charles Evans, the situation recalls the Asian financial crisis of 1998. 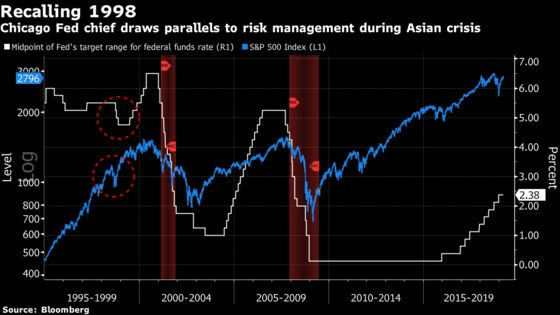 That summer, U.S. stocks fell almost 20 percent over six weeks, eliciting rate cuts from Alan Greenspan’s Fed soon thereafter, as officials sought to pre-emptively ward off any contagion to the U.S. economy. Evans, who attended Federal Open Market Committee meetings at the time in his capacity as an assistant vice president at the Chicago Fed, used the episode to put the central bank’s recent pivot to patience into context. The analogy may have implications for monetary policy later this year if financial markets take a turn for the worse again, following a period of volatility in the final months of 2018. On March 20, Fed officials surprised investors by slashing forecasts to signal no rate increase this year, down from the two moves flagged in their December forecast. In a post-meeting press conference, Fed Chairman Jerome Powell said slower growth overseas contributed to the dimmer U.S. outlook. The Fed’s updated rate projections still envisioned one rate hike sometime next year, provided the economy stays on track. U.S. money markets are now priced for more than half a percentage point of easing over the next two years, and yields on U.S. 10-year Treasury notes have fallen below those on 3-month bills for the first time since 2007, indicating growing expectations for Fed rate cuts. It’s a far cry from late last year, when investors shared Fed officials’ view that additional tightening was still the more likely scenario in the near term. Evans praised the 1998 decision. Fed officials reduced their benchmark overnight rate from 5.5 percent in September of that year to 4.75 percent by November, and kept it there until the following summer, when they began hiking once again. Powell was asked about the 1998 experience during his post-FOMC meeting press conference on March 20, including how the Fed’s rate cuts were blamed for stoking the dot-com bubble. His answer focused on the the central bank’s other tools aside from interest rates for preserving financial stability, and he indicated vulnerabilities weren’t currently seen as threatening. That sounded complacent to some.